Cost: $15 for first two employers, $5 for any additional employers; $70 for Gold Sponsorship (gold sponsorships are sold out), $50 for Silver Sponsorship (silver sponsorships are sold out). ***Thank you for your interests in our Spring Job and Internship Networking Mixer. All employer slots for this networking event have been filled. To be added to our wait list, please email Lesli Somerset at l.somerset@gmail.com. This networking mixer will be a great opportunity for you to get to know students in a relaxed setting. With students representing various academic programs including sustainability, health sciences, business and communication, and the arts & humanities, chances are you’ll be able to find a great fit to support the mission of your organization. Our students will also have the opportunity to learn about your company and you as a professional in the Pittsburgh region. Increase your visibility to students, become a sponsor! Registration has closed. 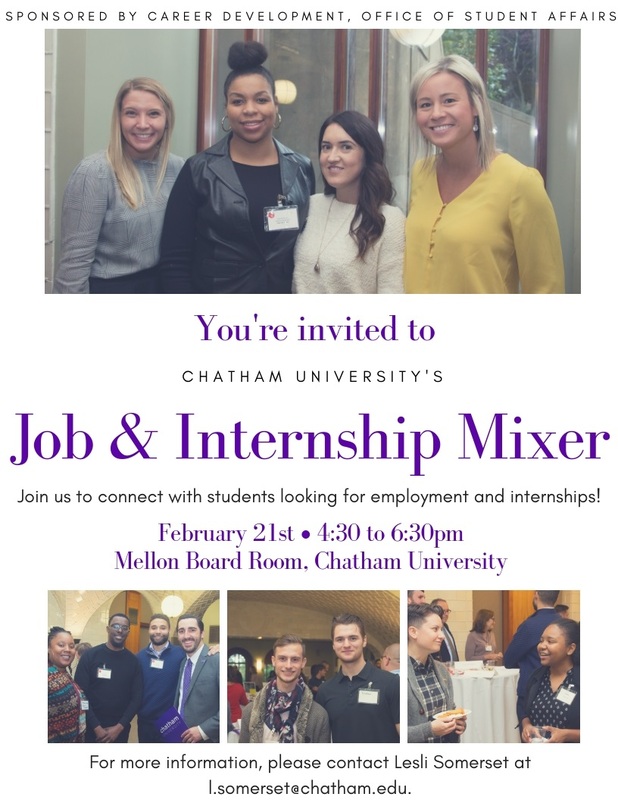 Please contact Lesli Somerset at l.somerset@chatham.edu for additional information. Fee : $15 for first two employers, $5 for any additional employers; $70 for Gold Sponsorship (gold sponsorships are sold out), $50 for Silver Sponsorship (silver sponsorships are sold out).